Hello again bloggers! I believe it has been approximately three weeks since I last posted which to me is such a long time, and the break has been for no real reason other than being so incredibly busy and not feeling very inspired to post. I think it's good to give blogging a break every now and again though and give 'real life' the full attention it deserves, however I'm now back in the game and normal order should be resuming! 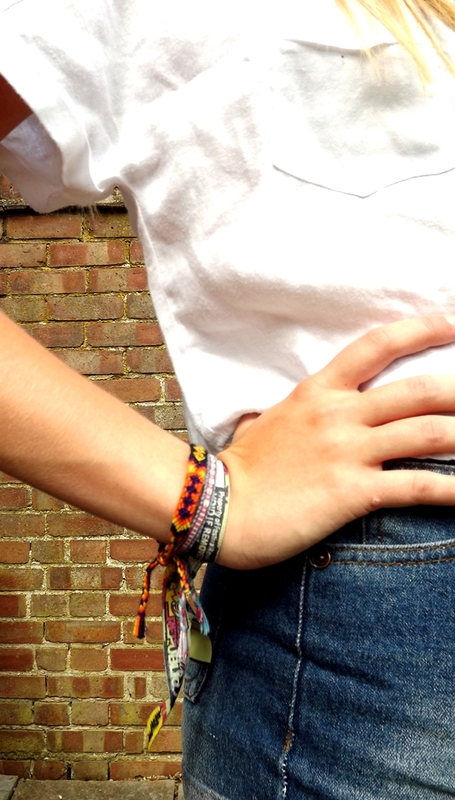 A brief update on what has been going on since you last saw me; I went on a beautiful and oh-so-relaxing holiday to Lefkada (a Greek island) with my family, I worked LOADS, I got my GCSE results which I am so so so proud of, and I went to Reading festival (you can see my wristband above) which was one of the best weekends of my life! Have any of you been to Reading or any other music festivals this year? My outfit today is very casual, but I just wanted to finally get a post up! I love this white linen cropped shirt which was a chance find in Forever 21. I've been wearing it 24/7 and it looks hawt with denim. I rarely find nice things in F21 so I was chuffed with this little bargain! See you in my next post (which hopefully won't be three weeks from now)..
Love this! Your shoes look so cute! You look lovely and so tanned! Congrats on your exam results. And your legs are redic tanned- beaut! Great post! Loving the creepers - I need to get a pair. I'm your new follower!